The descendant of a once ­wealthy and powerful family, Volta was born in 1745 in the Italian city of Como. In school he wavered between interests in poetry and science, but finally decided on a science career. 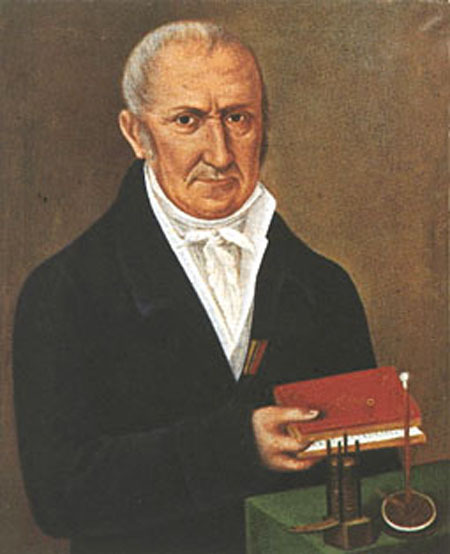 He began his long service as a physics professor at Pavia University in 1779. In Volta’s time the only way to generate static electricity in a laboratory was by friction from rubbing two electrical insulators together. In 1775 Volta invented an interesting device, called an electrophorus, that could store a static charge for some time after being rubbed with fur or cloth. The trouble was that all of the electrical equipment of the time held the charge in place and would release it only in high ­voltage but low­ power blasts. No one had a way to produce electricity smoothly or in a large quantity. Volta realized that the frog leg was just a source of moisture, and the electricity was actually produced by the two metal electrodes. Some metals, like copper, hold their electrons more tightly than others, such as iron. It was the combination of two different metals touching the frog leg that generated the electricity to make it twitch. Galvani did not want to give up his explanation, though, and a bitter rivalry grew between the two men because of their interpretations of the experiment. Volta went on to develop the first electric battery in 1800. He used cups of dilute acid to provide the moisture for strips of copper and zinc. The French Emperor, Napoleon, was so impressed that he visited Volta in 1801 and awarded him a gold medal for his discovery. Volta lived the rest of his life in his hometown of Como and died on March 5, 1827. Volta’s introduction of the electric battery extensively influenced everyday life, and the production of steady electrical currents played a vital role in the development of nineteenth­ and twentieth­century science. All of the great scientists of the nineteenth century needed steady, reliable sources of electric current. Without Volta’s batteries, ANDRÉ AMPÈRE and Hans Christian Oersted could not have investigated magnetic fields, GEORG OHM and Gustav Kirchhoff could not have mastered electric current, MICHAEL FARADAY could not have seen the way to generate electricity from magnetic fields, and JAMES CLERK MAXWELL could not have unified it all with his theories on electromagnetism. Volta’s battery and variations on it can be seen in many aspects of our daily lives. The batteries used liquid acid, so they were called wet cells; car batteries, which also contain liquid acid, are direct descendants of Volta’s original models. In AA ­size alkaline cells, the liquid add has been replaced with a thick chemical paste that is far more efficient and longer lasting than anything Volta imagined, but they still operate on the same principle. Other innovations on Volta’s invention include cells based on the chemistry of lithium or silver oxide and rechargeable cells made of nickel and cadmium ore. Each has distinctions and advantages, but all are distant cousins of Galvani’s frog leg and more direct descendants of Volta’s cells. The unit of measurement for electrical drive or motivation is called a volt, as a testament to Volta’s influence in the development of electricity.